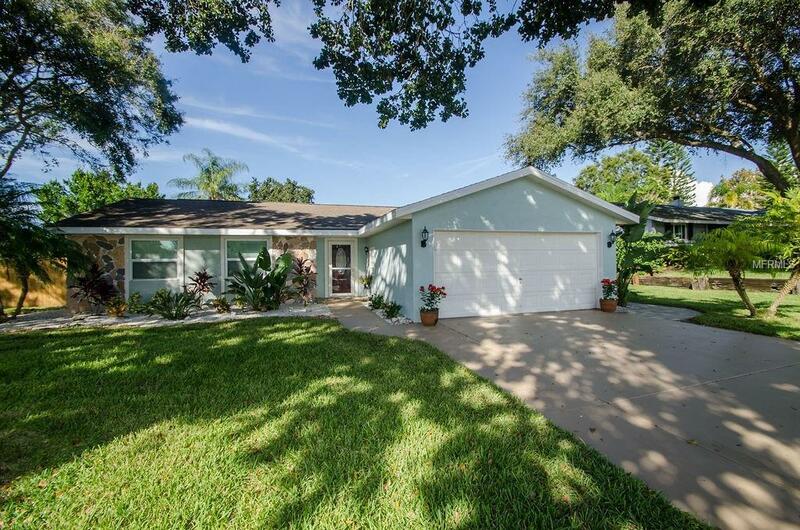 Looking for a turn key Palm Harbor pool home just minutes from the beach? This is it! Every inch of this house has been meticulously updated and well maintained. This home features 3 bedrooms, 2 full bathrooms, 2 car garage, an OVERSIZED POOL and an OVERSIZED LOT! The house has an open concept living room, dining room and kitchen. The kitchen is very spacious and features wood cabinetry, new countertops and a huge island in the center. The kitchen also has a large walk-in pantry and built-in desk/office area. The main areas of the home feature bamboo flooring and modern ceramic tile, while the bedrooms have carpet for extra comfort. Both bathrooms have been updated with tile floors & showers, new bath tub, new fixtures, new vanities and light fixtures. Both the main room of the house and the master bedroom have views of the oversized pool and sprawling backyard. The sparkling pool has a screen enclosure, covered patio and child safety fence. The yard features a newer paver walkway and a Shed that will stay. The tropical landscaping and seashell flower beds surrounding this home make you feel like you are at a resort. You can bike to downtown Palm Harbor, Ozona or the Dunedin Causeway from this house! Zoned for excellent rated schools - Ozona Elem, Palm Harbor Middle and Palm Harbor University High School. New exterior & interior paint 2018, A/C replaced 2012, Electrical Panel replaced and newer double pane windows throughout. Priced to sell and won't last long!